I ask a lot from my students. I push them to read closer and to read more; to write precisely and to write well; to defend their views and to understand the logic behind alternatives. And students ask a lot from me. I don’t simply mean creating thoughtful lesson plans, writing recommendations for their law school or film school applications, or advising their senior theses. Students expect an education. Students expect me, to paraphrase one of my own teachers, to nurture their ability to make more complex, and more profound, the meanings they attach to events and social phenomena. My statement of teaching philosophy is available upon request, and selected teaching experiences from my curriculum vitae are described below. While penal law stretches back to antiquity, caging and confinement as mainstream forms of punishment are relatively recent historical phenomena. In this course we will investigate modern prisons, placing particular emphasis on prisons in the United States. Punishing wrong-doers for their misconduct seems self-evidently appropriate, but this simple idea becomes complex and controversial when applied to particular cases. It matters *why*. Why, precisely, is a given punishment appropriate? With this question in mind, we’ll start the course by surveying the normative principles that animate contemporary penal law. Ideals and practice, of course, often diverge. The next leg of the course is devoted to the history, politics, and lived experience of prisons. While public law is used to frame a number of key topics — prisoners’ rights, labor, racial discrimination, cruelty, treatment of mental illness — the readings do not simply focus on the courts. We’ll be analyzing texts from an eclectic group of scholars that span the social sciences, philosophy, and law. The final unit of the seminar introduces students to the phenomenon of “mass incarceration.” We’ll investigate the decisions (and non-decisions) that facilitated the five-fold growth of the US prison system over the last few generations, and we’ll survey debates among prison reformers and abolitionists about what can and should be done. Law and Democracy. Fall 2017. Syllabus available here. It’s been noted that the two and a half millennia during which democracy has been discussed, debated, attacked, supported, ignored, established, destroyed, and re-established has not, in fact, produced agreement on some of the most fundamental questions about democracy. Chief among those concerns is the place of law. This course introduces students to the complex and contested role law plays in shaping democratic institutions and civic life. We’ll discuss both court cases and case-studies, focusing on election law and disqualification, and those discussions will be enriched by reading a wide-ranging assortment of political and legal theorists. Constitutional Foundations. Summer 2017. Syllabus available here. The Preamble to the U.S. Constitution begins with the phrase “We the People.” This formula for democratic rule is deceptively simple. This course introduces students to the complex constitutional structure of American government. Topics to be covered include Constitutional history, politics, and theory; the role of the states and the federal government in the federal structure; the allocation of powers among the legislative, executive, and judicial branches; and civil rights and liberties. PPL Capstone Seminar. Spring 2017, Spring 2018. Syllabus available here. 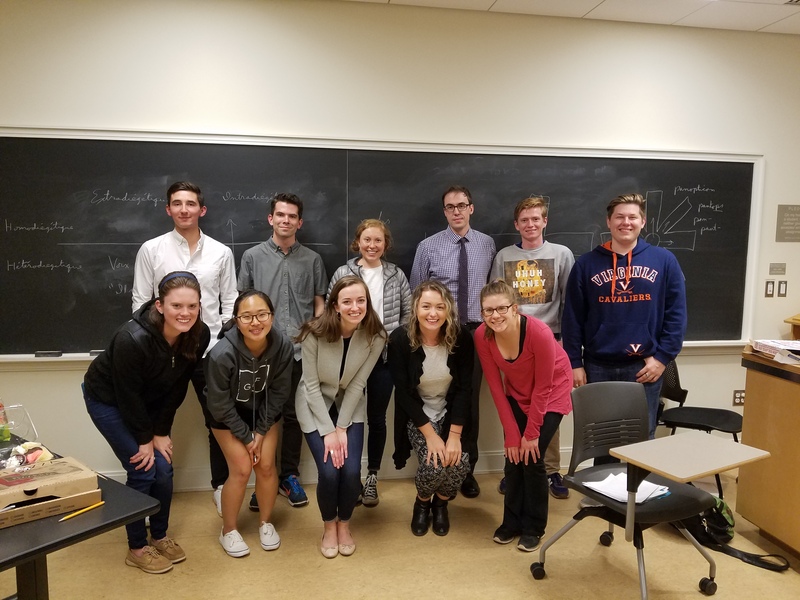 The capstone seminar is designed to help students carry out their fourth-year Political Philosophy, Policy, and Law (PPL) thesis and offer feedback on their progress. Over sixteen weeks, students will draft, revise, and complete a thesis in collaboration with myself, a faculty advisor, and classmates. Law and Political Thought: Punishment. Fall 2016. Syllabus available here. Law ‘on the books’ is not the same as law ‘in action.’ This course introduces students to the complex role that law plays in society through the issue of punishment. Law takes a variety of forms and serves a number of important social functions. We’ll investigate both court cases and case-studies, focusing on the eighth amendment, and that investigation will be enriched by reading an eclectic mix of political and social thinkers. B.A. Colloquium for Political Science. Fall & Winter 2013-14. Syllabus available here. Students who choose to write a B.A. thesis are required to enroll in the B.A. Colloquium in the Spring Quarter of the third year and continue to attend the B.A. Colloquium in the Autumn Quarter of their fourth year. The colloquium is designed to help students carry out their B.A. thesis research and to offer feedback on their progress. Classics of Social and Political Thought III. Spring 2013. Syllabus available here. The Politics of Mass Incarceration in the United States. Spring 2012. Syllabus available here. Since the 1960s, the United States prison population has quintupled; a staggering 1-in-100 adults are now behind bars. It has been suggested that “the reality of crime as the target of our criminal justice system […] is not a simple objective threat to which the system reacts: it is a reality that takes shape as it is filtered through a series of human decisions running the full gamut of the criminal justice system.” In this course we’ll focus on those human decisions. Starting with the birth of the modern penitentiary at the turn of the 19th century, this seminar will explore the political decisions (and non-decisions) that facilitated the creation of mass incarceration in the U.S.
Resident Heads live in the College Houses where they have direct, daily contact with College students. Each House has a Resident Head; most Houses have Resident Head couples. They live in the halls year-round. As active participants in House life, they assist undergraduates in developing residential communities that provide an environment conducive to serious study, rest, recreation and the development of healthy human relations. They offer adult guidance and support to individual students, and serve as responsible stewards of their House community.